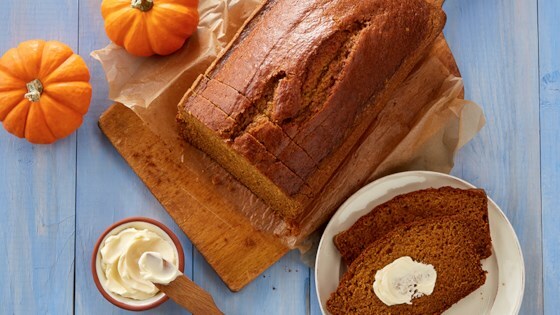 "Enjoy all the flavors of pumpkin pie in this easy, delicious, and moist pumpkin bread. Keep it in the refrigerator for a quick breakfast, snack, or even a not-too-sweet dessert." Heat oven to 350 degrees F. Grease 9x5-inch loaf pan. Line bottom with waxed paper or parchment; grease paper. In large bowl, mix flour, sugar, baking soda, salt, cinnamon, ginger, and nutmeg with electric mixer on low speed. Add remaining ingredients. Beat on low speed until ingredients are moistened. Beat on medium speed just until creamy. Spread evenly in pan. Bake 60 to 70 minutes or until toothpick inserted in center comes out clean. Cool in pan 10 minutes. Remove from pan and cool completely on cooling rack, about 1 hour. Store in refrigerator if desired. Nutrition Analysis per serving: Calories 260, Calories from Fat 90, Total Fat 10g (15% DV), Saturated Fat 1g (5% DV), Trans Fat 0g, Cholesterol 30mg (10% DV), Sodium 220mg (9% DV), Carbohydrates 40g (13% DV), Dietary Fiber 1g (4% DV), Sugars 26g, Protein 3g, Vitamin A 50%, Vitamin C 2%, Calcium 2%, Iron 6%. Didn't change anything only added nuts and cranraisins. Delicious! Very good. I will definitely use this often. I would like to try it with some nuts next time. The pumpkin bread was delicious. I followed the directions to the letter.